The people from Barnsley think their town is right grand. More than anywhere, people are reluctant to leave. Barnsley voters believe in community identity. They elect Labour MPs with 60% of the vote. The existing metropolitan borough was formed in 1973 and has always been Labour controlled. My best man was from Barnsley. He pronounced the word water so it rhymed with batter. Today the accent is not so distinct. Local pride has suffered. Barnsley once produced the finest beer ever. ‘Barnsley Bitter’ would emerge like yellow milkshake and then settle into pure white cloud over a golden horizon. Whitbread Brewery abandoned it to reduce costs and sabotage the British palate for future exploitation. Barnsley learnt that community spirit and identity have limits when dealing with corporate power. Similar limitations were exposed in the Miners Strike of 1984 when Thatcher defeated the miners. Her victory required working class collaboration. Ordinary people were divided by uneven prosperity and, like the guests at Abigail’s Party, infected by raw aspiration. Even my best man changed. He took me to a wife swapping party. Somehow I escaped. Loyal to tradition but knowing the worst of themselves and others, Barnsley folk understand what exists outside and what they could have been. Although mining communities were noted for social conservatism, Women Against Pit Closures began in Barnsley. This year the Experience Barnsley Museum honours the strike. In the Battle Of Orgreave, 8000 policemen faced 4000 miners. The right and the left argue about the numbers. Orgreave was outside Barnsley, as were all the mines. The miners lived in Pennine villages. Most still live there but they are not miners anymore. The villages are battered by post-industrial poverty. Workers inside Barnsley have a different history. When travel between London and the North expanded, Barnsley enabled travellers to rest, eat, drink and shop. The Royal Charter of 1249 permitted Barnsley a Wednesday market day. The market, regarded as the best in Yorkshire, now opens six days a week. In the 18th Century the Industrial Revolution brought to the town linen weaving and glass making. The splendid Town Hall is made of Portland Stone and has a 145 feet tower. The building resembles Stormont. Both are classical but puritan monuments affected by history. As darkness arrives, the tower of the Town Hall is lit blue. Locals are suspicious of anything poncey. They claim that the mayor has bought a sun bed. Radio station, We Are Barnsley, has the recommended Northern Soul And Tamla Show. The Arctic Monkeys, studied music at Barnsley College. Barnsley also has a rap group called Yes Sir. If they ever become famous, P Diddy will have an identity crisis. Brian Glover was a Barnsley actor. He played a schoolteacher who imagines he is Bobby Charlton. Barnsley, though, has a football team. Few in Barnsley would favour Manchester United. Unemployment in the last two years has risen by 13%. 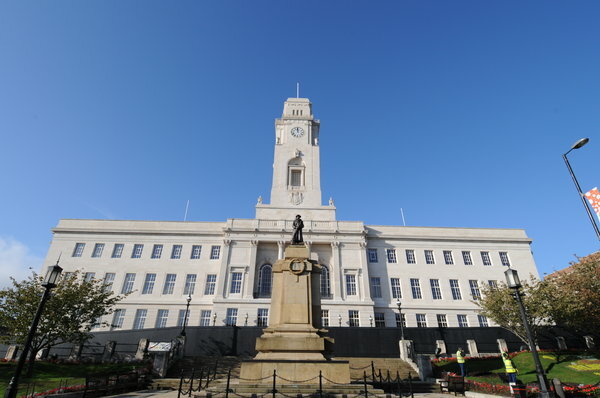 Like most urban centres, Barnsley has a Jobs And Business Plan. The good news is that Acorn Brewery has revived Barnsley Bitter. Posted in Actors, Barnsley, Beer, Football, Labour, Local radio, Miners Strike 1984, Museums, North Of England, Trade Unions, Women's labour movements, Yorkshire and tagged Abigail's Party, Acorn Brewery, Amazon, barnsley, Barnsley Town hall, Battle Of Orgreave, Bobby Charlton, Brendan Gleeson, Experience barnsley Museum, Famous Pie Shop, George Orwell, Northern Soul, P Diddy, Tamla Motown, Women Against Pit Closures on January 18, 2015 by Howard Jackson.